Six men have pleaded guilty to piracy in connection with the seizure of a Russian cargo ship last year. Prosecutors in a court in Arkhangelsk in north-west Russia have accused them of hijacking the Arctic Sea vessel, which went missing for two weeks. The mysterious circumstances prompted speculation that the ship was involved in a high-level smuggling operation. Despite their guilty pleas, five of the men deny some of the details of the charges. The Arctic Sea set sail from Finland in July 2009 with a crew of 15, and was said to have been on its way to Algeria with a cargo of timber. But its tracking system was switched off just after it had passed between Britain and France - triggering a highly unusual international search for a large ship that had simply disappeared. 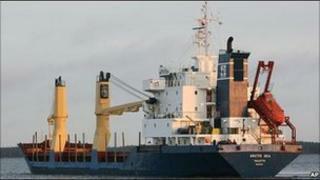 On 17 August the Russian navy said it had found the ship off the Cape Verde islands in West Africa. The BBC's Daniel Sandford in Moscow says there is still speculation that the ship was involved in a smuggling operation, and there have even been claims it was a carrying air defence missiles for Iran. But the Russian prosecutors' case is that this was a straightforward hijacking of the ship in order to raise a ransom, our correspondent says. At the court in Arkhangelsk, prosecutors said the six had attacked the Arctic Sea and repeatedly threatened to use weapons against the crew. They were also accused of telephoning the ship's owner and an insurance company to demand a ransom. "Five defendants pleaded partially guilty, and one pleaded guilty to all the charges," a court spokeswoman said. The Russian news agency Itar-Tass says the defendants could face jail terms of between 10 and 15 years. It named them as Alexei Andryushin, Dmitry Bartenev, Alexei Buleyev, Igor Borisov, Vitalijs Lepins and Yevgeny Mironov. It said three of them were "without citizenship", while the others included a Russian, a Latvian and an Estonian. Three other defendants, including the alleged ringleader, made a plea bargain earlier this year and were given prison sentences of between three and seven years.